If you have come to this page via a browser, you may find something of interest elsewhere in our other Hendry Family History Pages. Both my grandfather John Williamson Hendry and my father J. M. Gordon Hendry were officers within the Glasgow Highlanders, and both saw active service, my grandfather in World War One and my father in World War 11. As a youngster I well remember the battle to keep the Glasgow Highlanders "alive", but sadly to no avail. Like many of his generation my father told me very little of his experiences during this time. However after his death I found two documents a history of the 1st Battalion during 1939 - 1945 and his own personal War Diaries for 1944 - 1945. As a tribute to them and all the other men and officers of a regiment now sadly passed into history I have put together this website to make the family photographs and documents concerning the Glasgow Highlanders available to a wider audience. I hope that they may be of interest and would welcome any feedback via the contact form by clicking on this link . 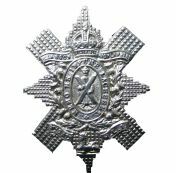 In 1868, by the command of Her Majesty Queen Victoria, a volunteer battalion of Highlanders was raised in Glasgow and designated as the 105th Lanarkshire (Glasgow Highland) Rifle Volunteer. Initially they wore the uniform of , and based their cap badge on that of the Black Watch. It consisted of 12 companies. In 1880 the Glasgow Highlanders were re-designated the 10th Lanarkshire Rifle Volunteers. However following the re-organisation of 1881 where volunteer battalions were incorporated into the regiments belonging to their districts they became the 5th (Volunteer Battalion) Highland Light Infantry. They continued to wear the Black Watch uniform but also took on the traditions of the H.L.I. second senior regiment amongst the Highland regiments after the Black Watch. They were based at Greendyke Street drill hall near Glasgow Green and were distinctive because they continued to wear their kilts in contrast to the rest of the HLI, who wore trews. Detachments were sent to South Africa during the Second Boer War and earned the battalion its first battle honour, for service on the Modder River. In 1908 they became the 9th (Glasgow Highlanders) Battalion, The Highland Light Infantry, when they became part of the 52nd (Lowland) Division in the new Territorial Force. During the First World War they recruited another two home-based battalions, one of which was a Bantam battalion, which were used to supply manpower to the 1st Battalion in France, which served with distinction with the Highland Light Infantry under the 2nd Division at the battles of Festubert and Loos. In May 1916 they transferred to the 33rd Division and fought at the Somme (at High Wood), Arras and Passchendaele. After the end of the war, the Glasgow Highlanders were disbanded along with the rest of the Territorial Force, but in 1920, it was re-established as the Territorial Army, and the Glasgow Highlanders re-raised a single battalion. They later moved to a new Headquarters in Maryhill in 1935. When war was declared in 1939 the battalion went to war again and also raised a second battalion, they fought valiantly as part of the 52nd (Lowland) Division and 15th (Scottish) Division in the Second World War, most notably during the capture of Walcheren Island during the Battle of the Scheldt in November 1944. In 1949 it was re-designated the 1st Battalion, The Glasgow Highlanders, The Highland Light Infantry (City of Glasgow Regiment) and in 1959 transferred from the Highland Light Infantry to the new Royal Highland Fusiliers Regiment. The Glasgow Highlanders being a territorial unit kept their name. In 1967, with the formation of the Territorial Army Volunteer Reserve (TAVR), the battalion laid up its colours and was amalgamated with the other TA battalions of Regiments in the Lowland Brigade, which were reformed as companies in three new TAVR battalions. The name of the Glasgow Highlanders was initially carried on through HQ (Glasgow Highlanders) Company of the 52nd Lowland Volunteers and C (Glasgow Highlanders) Company of the 3rd (Territorial) Battalion, The Royal Highland Fusiliers, but with the disbandment of the latter in 1969, it was only carried on by HQ (Glasgow Highlanders) Company of the 1st Battalion, 52nd Lowland Volunteers. It later changed its affiliation to The Royal Highland Fusiliers in 1973, thus formally ending the existence of a Glasgow Highlanders unit within the Territorial Army. The Glasgow Highlanders' name was continued by a platoon of the Army Cadet Force, attached to 52nd Lowland Regiment. However in 2007, this Army Cadet Force unit changed its affiliation to 52nd Lowland, 6th Battalion The Royal Regiment of Scotland and became F Platoon, Royal Highland Fusiliers (Maryhill) but still have the history of the Glasgow Highlanders taught to them.